The Jamestowne list of 1622 has a waste-coat on it. I have assumed that the waste-coat is referring to a coat worn for foul weather. The Gorinchem coat has long sleeves a small upright collar and a hip length skirt. It does not look too different from a windbreaker, if you do not count the skirting. I needed an outer layer garment for Virginia weather. My son does not wear a winter coat unless it snows, so the coat would have to be made from a heavy linen. 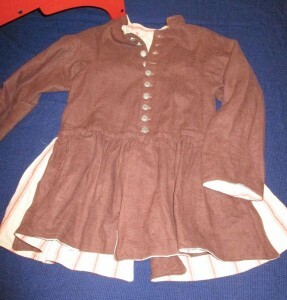 The Tudor Child coat directions are best attempted by somebody who knows how to sew. I am not sure that I added enough room for growth. Time will tell.